Hi, darlings!! I'm am SO happy this afternoon! It's Friday and not just any old Friday in the grand scheme of things, but the Friday that marks the beginning of 12 days off from work! YES! 12 WHOLE DAYS! Just thinking about all that sleep is making me giddy with happiness! I also have another cause for being excited! I'm going to reveal a new brand that I've been so anticipating reviewing--B Squared Lacquer. When my girlfriend Jill from Glisten & Glow stumbled across Mia's brand on Instagram, she totally fell in love with both the polishes and their super-sweet maker! I hadn't seen Jill talk this excitedly about a new indie brand in a long while so I knew I had to find out more! So when I approached Mia about possibly reviewing for her, imagine my delight when she told me she reads and loves my blog! Win-win for us both! And boy, oh boy, this incredibly pic heavy post should bear testament to just how much I LOVE her polishes! 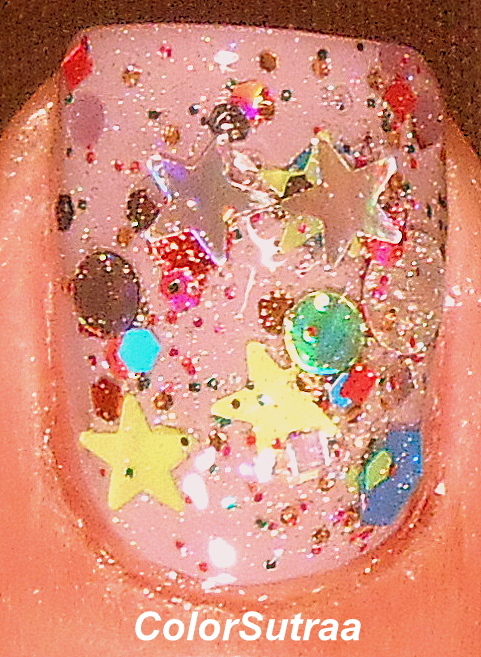 First up, I have for you Glitzy--a clear glitter topcoat filled with holographic gold and silver glitters in various shapes and sizes, including large circles and stars! The formula and application on this polish was phenomenal--I literally didn't have to fish for a thing! 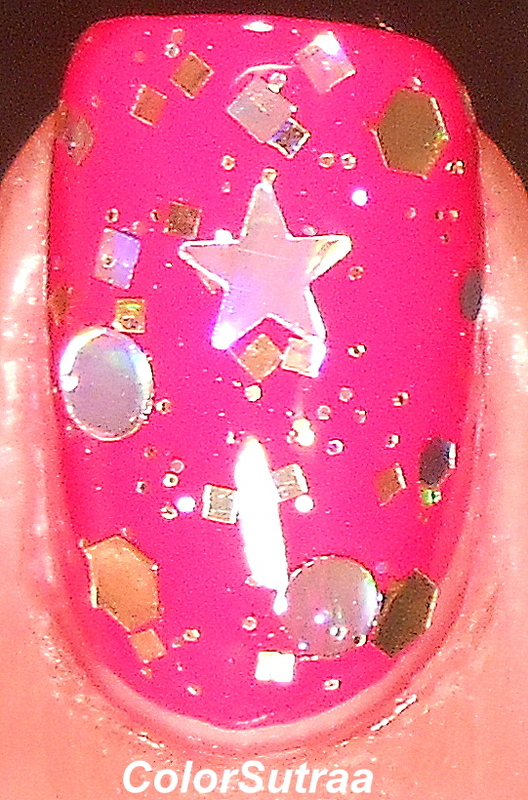 The swatches below show 2 smooth coats over 2 coats of Barry M Pomegranate, topped with 1 generous coat of G&G's HK Girl. I absolutely adore how this look turned out--so festive! Matted using 1 coat of Butter London's Matte Finish Topcoat, with and without flash! 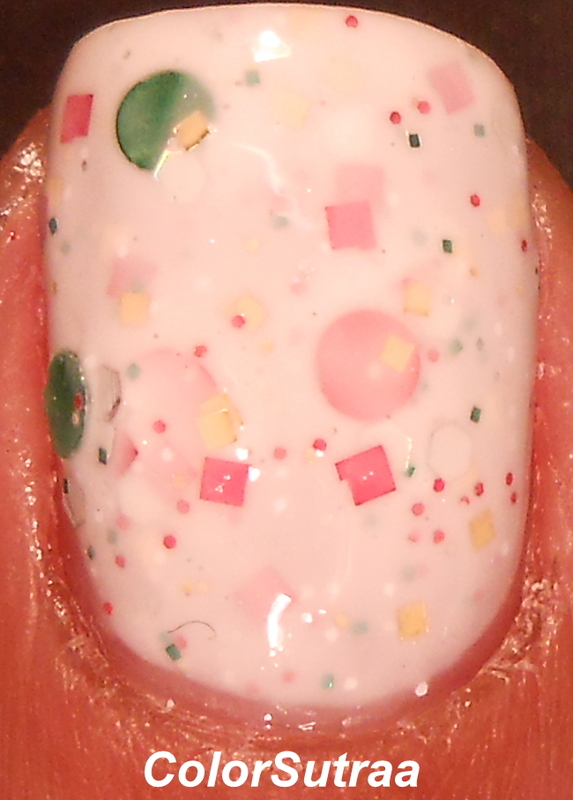 Next, I have for you a polish whose name totally made me giggle--Ho cubed is a white crelly with silver, gold, red and green hexes in various sizes, accented with green and red medium circle glitters. Though I had no issue with the application per se, I do feel this polish would benefit from being worn with "undies"--a plain white creme would bring this together even better! 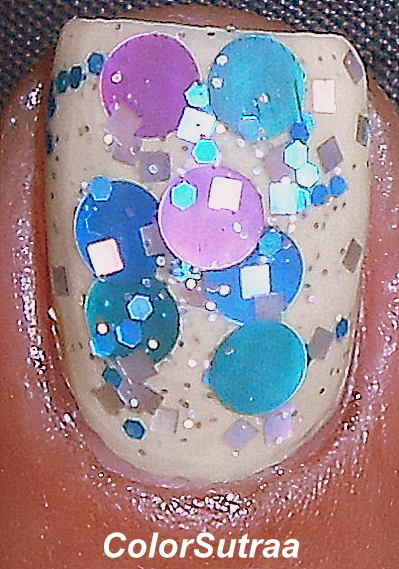 The swatches below show 3 coats by itself, topped with 1 generous coat of G&G's HK Girl. 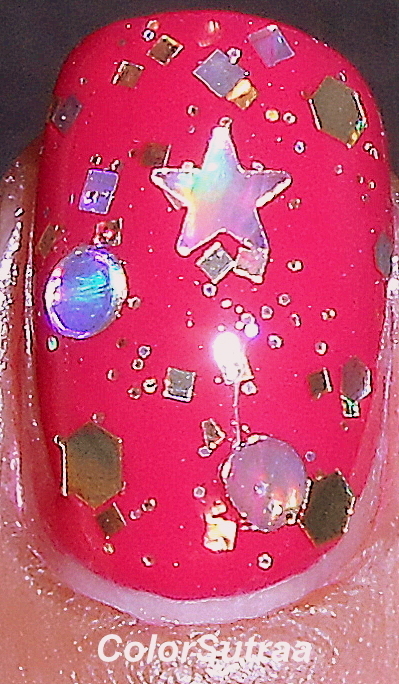 Third in this collection, I have for you Holoberries--a beautiful cranberry holographic polish. No complaints on formula or application and the swatches below show 3 coats on its own. Though the holographic effect wasn't super strong, this is such a gorgeous shade and I really liked it! 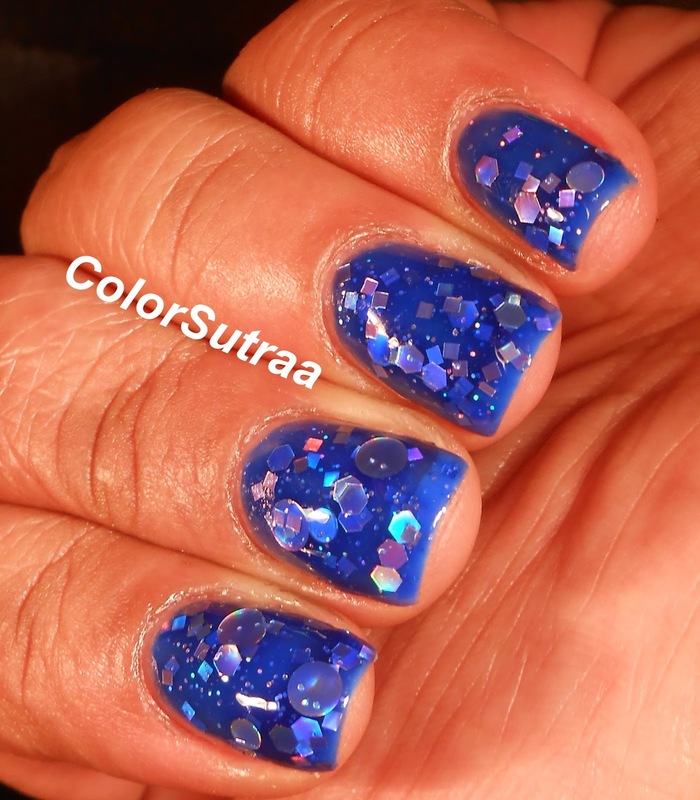 Next, we come to my absolute favorite in this entire collection--Iceberg is vibrant royal blue jelly polish, packed full of silver holographic glitters in various shapes and sizes, including large holo circles! Once again, the formula and application on this polish was phenomenal. The swatches below show 3 by itself, topped with 1 generous coat of G&G's HK Girl. I cannot begin to tell you how MUCH I love this polish! Look at it! SUCH a stunner! Next up, I have the sister to Iceberg--Midnight is a black jelly polish, packed full of gold and silver holographic glitters in various shapes and sizes, including large holo circles and stars! Great formula and application on this one too, so I'm really super impressed with the quality and consistency so far! The swatches below show 3 by itself, topped with 1 generous coat of G&G's HK Girl. Though I love the depth of this polish when worn by itself, I'm also going to layer it over a plain black creme...or dark navy to see what I come up with! Ooh! 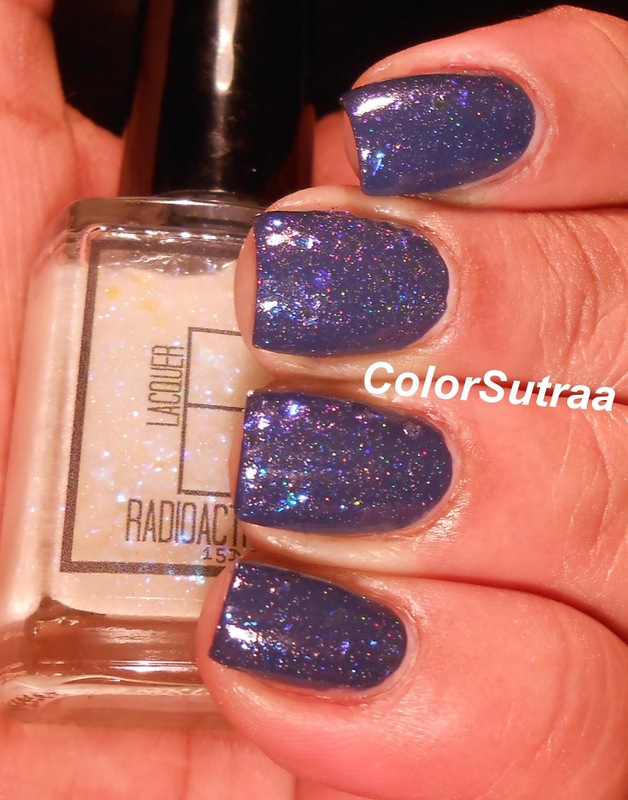 The next polish in the collection is Radioactive--an "flakie" topcoat with flakies that change from blue to purple in a clear base with added holographic and purple shimmer. Again, no complaints on either formula or application and the swatches below show 2 smooth coats over 2 coats of Zoya Sailor, topped with 1 generous coat of G&G's HK Girl. 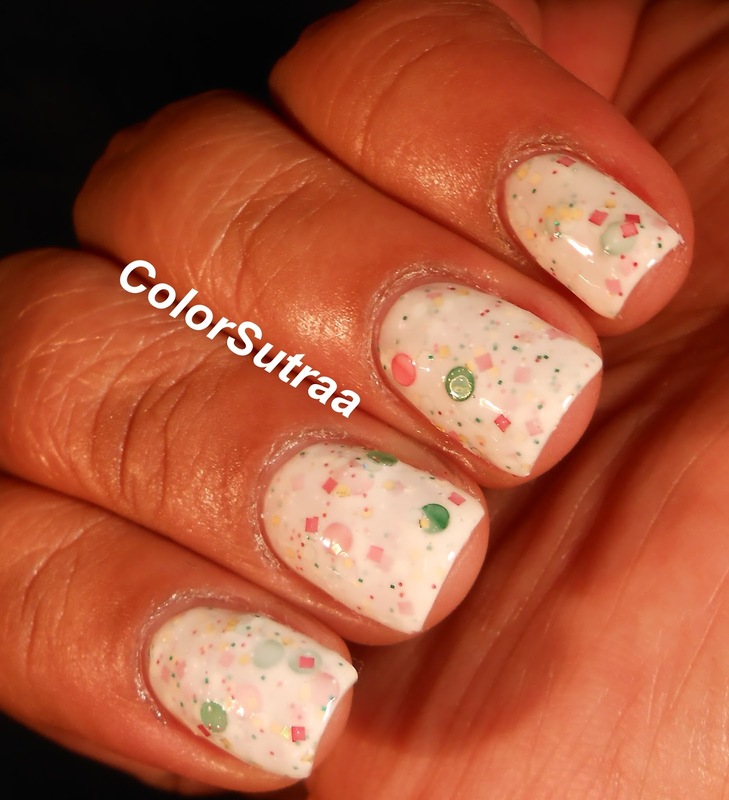 If you love flakies, then this is a must-have for you! Next up, I have for you White Lights--a white crelly with gold holographic hexes in various sizes, with added gold shimmer. Now I did have a bit of an issue with the application of this polish--it's so full of these gold glitters, that the brush tends to drag and polish tends to clump at the tips. 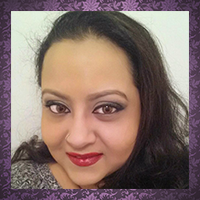 My advice is to either use a plain white creme as "undies" OR use generous coats, a steady hand and LOTS of topcoat. 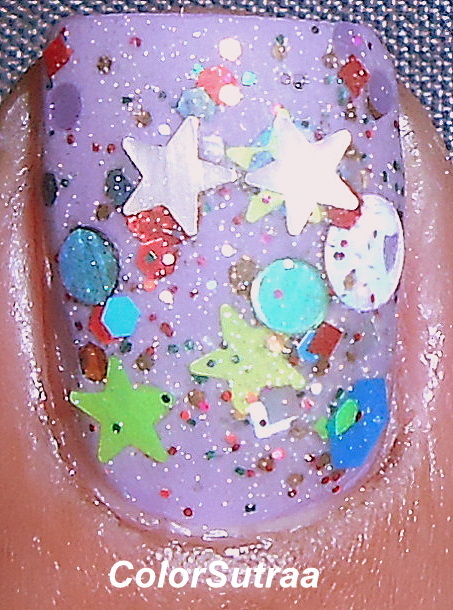 The swatches below show 3 coats by itself, topped with 2 generous coats of G&G's HK Girl. Done right, this polish is so elegant! 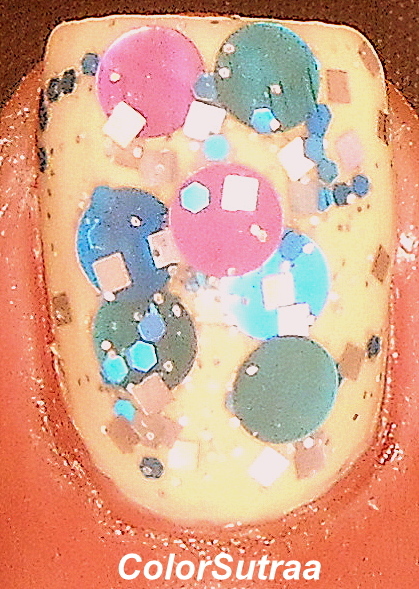 Last but not least, from this collection, I have for you Whoville--a glitter-bomb filled to bursting to all manner of neon and bright glitters in lots of shapres and sizes, including medium lime green and holographic stars! Again, the formula and application was such thatI have had to swirl the brush in the polish and tons of glitter came right on up! The swatches below show 2 generous coats over 3 coats of OPI Planks A Lot , topped with 1 generous coat of G&G's HK Girl. SO fun! BONUS! The next two polishes are ones I snagged from Mia's Black Friday sale because I saw them on her Facebook page and fell in love! They are 2 releases from earlier in the year--Purple Unicorns and Instafamily! First of the two is Purple Unicorns--a lovely grayed out lavender linear holographic polish with a gorgeous blue-green shimmer! 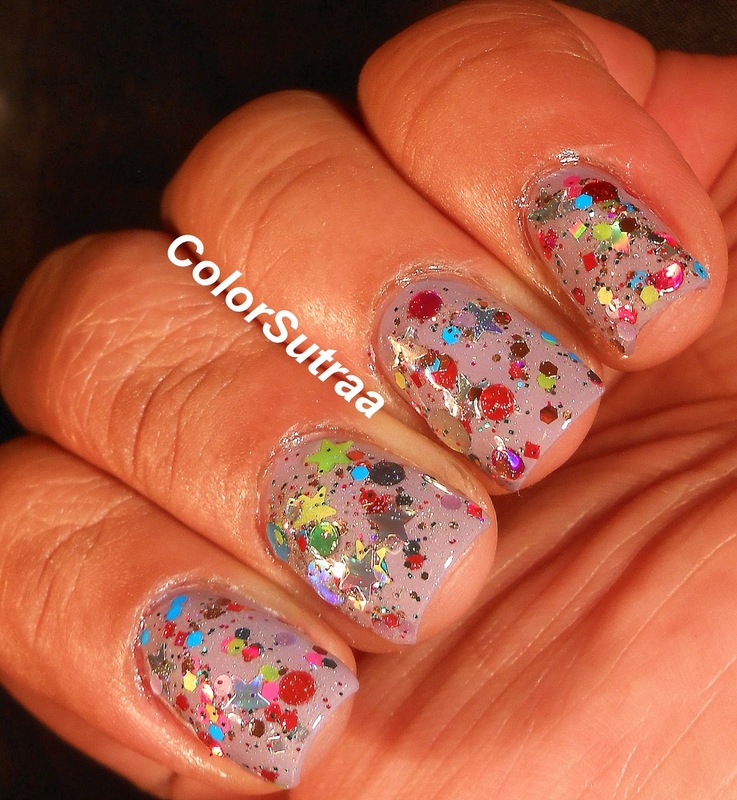 No issues with application or formula and the swatches below show 3 coats on its own. I absolutely love how different this polish looks in different angles of the light! Which of these beauties is YOUR favorite? Tell me in the comments section below!